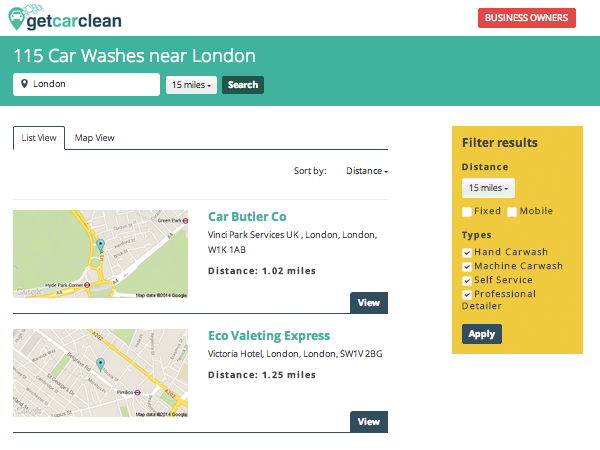 Get Car Clean is the largest UK directory of car wash's near you. Get Car Clean can help you find a Hand Car Wash Near Me, a valeter or detailer that can professionally clean your car. Use our location and map search to find one anywhere in the UK. Your car may be your best asset and you will want a hand car wash specialist to wash your car inside and out with love and care. By using a hand car wash specialist you will also avoid the harsh brushes used in automated car washes which may be harmful to the body of your car. Cleaning the trickier parts of your car will be easier as the jet sprays can be aimed at tough to reach areas. You will also receive a personal service as satisfaction will be guaranteed. Typically, when you go to a hand car wash near you, you will have two or three specialists clean your car inside and out. One spraying down your car, one shampooing and washing and another hoovering and polishing the inside. Your car will be sparkling clean and highly polished in minutes ready for you to drive away in less than no time. Get Car Clean lists the best local car wash's as well as national and prestige companies. Our unique map view option lets you view all of the companies instantly. We also have a GeoLocation service which you can use on mobile devices, helping you to reach your car wash company quickly and easily.